Art is a story and all children love stories, right? Modern & contemporary art is usually about color, line, shape, technique, the idea (conceptual art), and society (overproduction of product, commercialism, mass-production, …etc). To get your children interested in art, you might want to ask them, “What do you think this story is about?” and go from there! – and made our very own color wheels and color-mixing window collages (Ellsworth Kelly). The children and adults both enjoyed learning about the various artists and having the ability to sit down at the MET and actually do art projects together. The tour guide, Claire was great at pointing out how to be inspired by the art all around them. She also told the children about the backgrounds of the various artists. Parents were proud to watch their children ask questions, and to see how the art looked through their eyes. One little girl at the end of the tour even exclaimed, “As soon as we get home I am going to go to my room and draw a picture of my family and use all the colors I saw today!” How cute is that? Want to learn more about Museums Adventures or book your own tour? KidzCentralStation.com has lots of options – book here! This entry was posted in Art Classes, kids museums, Uncategorized on March 6, 2014 by Claire Mundy. In our quest to discover interesting NYC art for kids, Claire’s Creative Art visited some wonderful kid-friendly galleries you should know about. These galleries are in such close proximity and offer a wealth of exposure to a wide range of modern and contemporary artists. Along the way, our kids learned to direct their questions to the gallery owners, chose their favorite pieces, made sketches as well as articulate their “likes” and “dislikes” using the 7 elements of art to justify their choices. First stop was Isabel Bacher Gallery on 78th @ Madison, were we met our most enthusiastic and gracious gallery owner, Audrey. I would highly recommend a visit here to see a wide range of prints and printing processes of the masters like Toulouse Lautrec, Miro, Chagall, Matisse, Picasso, Dubuffet and Warhol. They are simple enough to sketch and bring colored pencils for Miro! Just next door are the gorgeous Lady M Cakes. What a great introduction to food painters and builders such as Claes Oldenburg and Wayne Thiebaud! 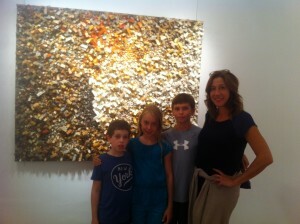 Saving the best for last was the Michelle Rosenfeld Gallery on 79th street. Cecelia greeted us at the door and showed us works by Kwang Young Chun (a fave for the kids), Murakami, Calder and even a surprising Yayoi Kusama. They were extremely inviting and wonderful with the kids. All in all, it was an eye-opening first day of the semester, lending an opportunity for me as a teacher to know where to drive our curriculum down the road, to revisit and demystify these artist’s works & processes, while promoting further understanding of the art world around us. As always, check first to make sure the works are child-appropriate, as they consistently change. Join us on our tours, and discover for yourself how rewarding it is to see and make art from the contemporary greats! Learn more about our classes and museum and gallery tours at Kidz Central Station. By Claire Munday, a professional artist and muralist as well as a dynamic art and music teacher. She leads art tours and teacher training throughout the city and is a consultant for large scale children’s events. Her background in theatrical set painting also allows for vast material use in class. 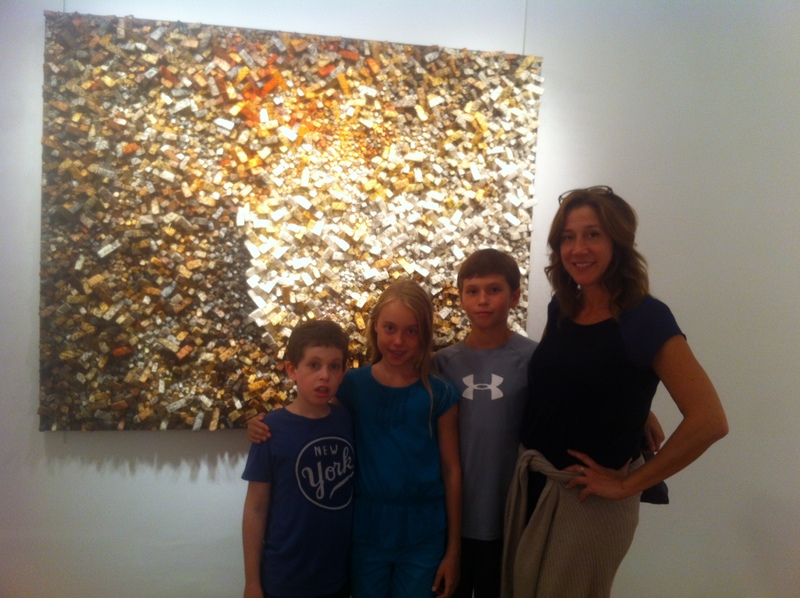 This entry was posted in kids museums and tagged art education nyc, art galleries NYC, Modern art, Tours for kids on October 4, 2013 by Claire Mundy. Children Approach Museums with Excitement and Know-how! 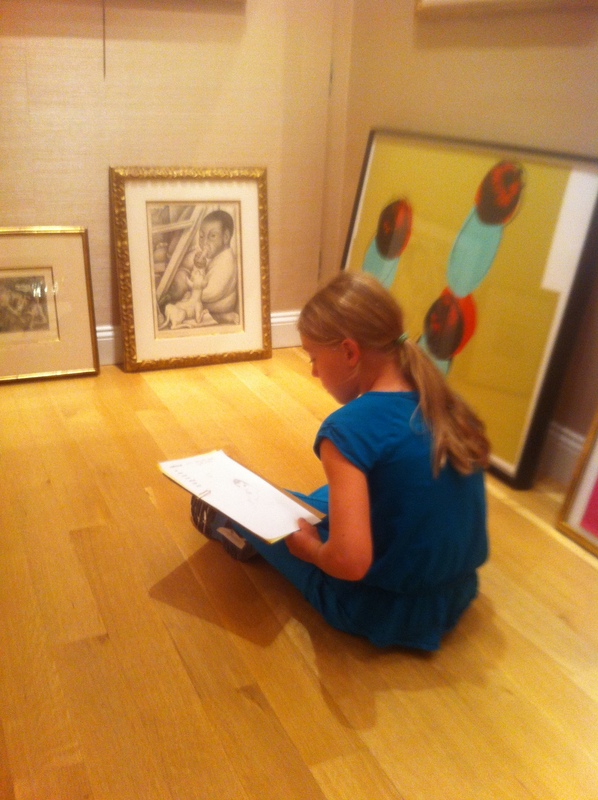 Are you a NYC family wanting to expose your children to the fascinating world of art around you that they can enjoy? Do you have friends or family members traveling through NYC seeking a truly memorable cultural experience together? We all know that New York City is known for its culture and the arts. It’s world-class museums and galleries provide an extraordinary opportunity to learn! So how can your child take advantage? Creating unique professional artist or theme-based visits that are educational AND entertaining is not an easy feat! First, children tire easily. Even getting to the artwork can be intimidating in large museums, especially those like the Metropolitan Museum of Art. And how do you know where to begin? There are ways to demystify not only the museum, but also the art processes, while making them easy to understand and fun to learn! Following a few simple rules can help. For many museums, just getting to certain galleries can be a hike. First, know where you are going before setting out. You don’t want your child to see it as a chore if you have to cover too much ground. Pick a small section each visit to explore more fully. Next, select just a few pieces that are in close proximity with each other, which provide ample learning opportunities based on one theme. Locating the artists with something in common helps to bring home specific ideas, without wearing out your child. Many artists may seem too sophisticated to share with kids. Not so! Breaking down the art processes of artists and making them easy to understand and fun to learn can be exciting! Of course ages and special interests are important to consider for each visit; Explaining color theory to a 4 year old by using the Impressionists may be too much, however, Ellsworth Kelly or Roy Lichtenstein is a great start. Balance and line exploration using Calder’s mobiles, or even metal-working with pieces from David Smith and John Chamberlain, is a pragmatic way to teach. Kids don’t want a lecture! Since there is no teacher like doing, actually making artwork in front of a piece of art is instrumental for kids! Knowing what materials work best, and which ones are appropriate in a public space, is also not easy. That’s often where experts come in. You may not feel comfortable bringing in recycled materials to discover El Anatsui’s magic, however, you can never go wrong with pencils, colored pencils or wire for your first endeavors as a parent. Be sure to switch it up: construct, collage or create colors with separate visits. Since a child’s attention span is short, each project needs to be divided into simplified steps, and include more than one simple hands-on project. Some great first galleries I would suggest are the modern painters at the Met. There are beginning discovery lessons in line, shape and color here like no other! Then those lessons can be applied to more artists, once digested. Keep it simple and fun. You want your child to be eager to not only go to see art, but excited by the process… and if you become a learner with your child along the way, you’ll see them making connections and coming to their own conclusions you would never have thought of! Don’t miss out on the amazing educational opportunity to discover art with your child by using your city’s resources. You may also wish to take advantage of an experienced and engaging tour leader to illuminate your experience. By Claire Munday, Founder of Claire’s Creative Adventures, LLC for kids ages 2-12. Museum and Art Adventures uses NYC’s modern, contemporary and multicultural art resources to go beyond school curricula to “demystify” artists and their processes. Children (and their accompanying adults) are introduced to modern and contemporary artists as well as diverse cultures, based on current exhibits from the myriad of NYC museums and galleries, providing all of the supplies, education and entertainment while actively engaging the children in the fantastic world of art from museum arrival to departure… Click here to book your next tour or class! This entry was posted in kids museums and tagged activities, art camp for kids, Art classes nyc, art education nyc, childrens art camps, classes, classes with my kids, education, infant, kids, kids art classes, kids' learning, Modern art, museum education, Museums, music for kids, NYC art classes, nyc musuems, Summer, toddler, Tours for kids, U.E.S. on August 15, 2013 by Claire Mundy.